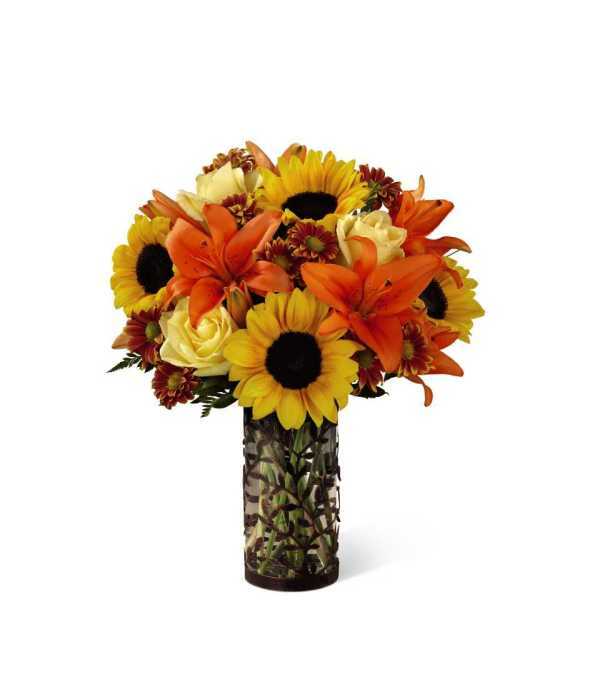 Make any fall occasion extra special with a bouquet that gorgeously captures the sunny essence of a golden walk in an autumn wood. 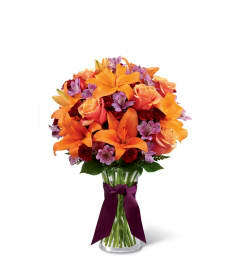 Some of the seasons sunniest blossoms - sunflowers, yellow roses and spicy orange Asiatic lilies are beautifully combined with burgundy daisy pompons in a hand-arranged bouquet that evokes dreams of a weekend in the country. The glass pillar vase, encased in a metal sleeve of lacy forest silhouettes, makes a sophisticated setting for this evocative bouquet. 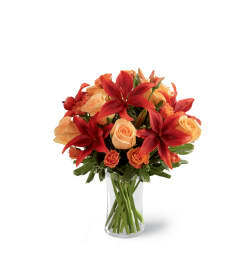 It makes a sensational birthday, anniversary or get-well gift; a delightful way to say "thank you" to a holiday host.